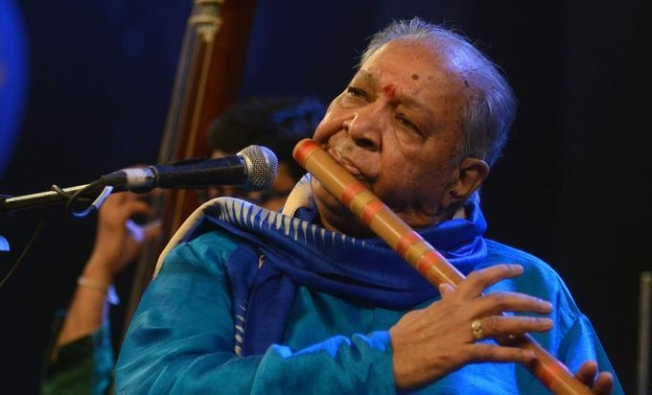 An internationally acclaimed flautist of India, Pandit Hariprasad Chaurasia is a very popular and eminent artiste par excellence who is known for his outstanding contribution in popularizing Indian Classical Music all over the world. His consummate artistry has distinguished him as the greatest living master of the North Indian Bamboo Flute, acclaimed both at home and abroad. Unlike many other great Indian artistes, Pandit Chaurasia does not come from a family of musicians. Rather, music is a path he found for himself and struggled very hard to overcome all the hurdles that came his way to emerge out successful with his sheer grit, sincerity, hard work, devotion and dedication. Born on July 1st, 1938 in Allahabad, he began his musical pursuit at the age of 15, learning classical vocal technique from Pandit Rajaram. Within a year, however, he had switched to flute playing, after hearing Pandit Bholanath, a noted flautist from Varanasi. He tutored under Pandit Bholanath for eight years. In 1957, barely out of his teens, he became regular staff artiste of All India Radio, Cuttack in Orissa, where he worked as performer as well as a composer. From here began his musical journey that took him all over the globe. Transferred by AIR (All India Radio) Cuttack to Mumbai in 1960, he received further guidance from Surbahar player Shrimati Annapurna Devi, daughter of late Ustad Allaudin Khan and sister of Ustad Ali Akbar Khan. Under her guidance his music acquired a new dimension and he left AIR to pursue his performing career. Since that time Pandit Chaurasia has been performing nationally and internationally winning acclaim from varied audiences and from fellow musicians like Yehudi Menuhin, Jean-Pierre Rampal, among others. Pandit Chaurasia tours regularly in the US and Europe and is a featured artiste in almost all major music festivals around the globe. As a musician Pandit Chaurasia is a rare combination of an innovator and a traditionalist. He has significantly expanded the expressive possibilities of classical North Indian flute- playing through his masterful blowing technique and his unique adaptation of alaap and jod to the flute. He is an immensely popular artiste in India and abroad. Pandit Chaurasia’s horizons also extend beyond North Indian Classical music to Indian folk and popular music and to western music as well. He has composed music for many Indian films. The famous “Silsila” which he collaborated on with Pandit Shiv Kumar Sharma was a platinum disc in India, and the musical duo Shiv-Hari went on to compose soulful music for many successful movies like Lamhe, Chandni, Faasle, Parampara, Sahibaan and Darr. His experimental album “Eternity” which incorporated many western elements alongside of North Indian Classical ones to become a platinum disc. Pandit Chaurasia has recorded many such albums in which he has tried to blend Indian Classical Music with western music to create beautiful and soulful music. He has recorded a compact disc at Oslo along with jazz artiste John McLaughlin and Jan Garbarek, which has gained international popularity. Besides these he has cut many albums of Indian Classical music, thematic music, music for meditation, bhajans and folk music. He has also shared stage with eminent artistes from all over the world. He has performed memorable jugalbandis with the stalwarts of Indian Classical music like Pandit Jasraj, Pandit Shiv Kumar Sharma, Ustad Zakir Hussain, Dr. Balamuralikrishnan, Smt. Kishori Amonkar and jammed with western artistes like John Mc Laughlin, Jan Garbarek, Larry Coryell, Egberto Gismonti and many others. He has conducted orchestras with western instrumentalists also amongst which is ‘Adi Anant’. In addition to his performance and compositions, Pandit Chaurasia also plays the role of a dedicated Guru & teacher. He has several dedicated and talented students not only in India but also around the world who are making their mark on the Indian Classical music front. When he is not touring and performing he is busy teaching music in Mumbai, where he has built a Vrindaban Gurukul, a Gurukul type ashram where he teaches music in the traditional Guru-Shishya Parampara. For his students hailing from Eastern and Central zones, he has another school in the same Gurukul style in Bhubaneswar, Odisha. He also teaches music at the Rotterdam Music Conservatorium, where he is the Artistic Director of the Indian Music Department.